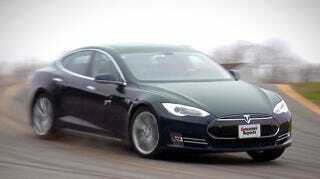 Consumer Reports, like Edmunds, plunked down the coin for a new Model S to get the full ownership experience. And like Edmunds, CR's Tesla has suffered from a range of minor issues that continue to illustrate that the devil is in the details. Since taking delivery of its Model S, Consumer Reports has racked up nearly 16,000 miles at the hands of testers and staffers, and they're still singing the Tesla's praises. But that enthusiasm is beginning to wane after the retractable door handles failed to deploy, one of the third row buckles broke, the front trunk lid wouldn't open, and the center screen – which controls damn near everything – went blank. The door handle situation was handled with an over-the-air update, while the buckle and trunk lid were replaced under warranty. A "hard reset" was necessary to bring the screen back to life, and while it was in for service, the shop "fixed a creak emanating from the passenger side roof-pillar area, disassembling and refitting some trim panels." But what's more interesting about CR's experience is the number of voluntary fixes Tesla is doing while the car is in for service. It replaced the "front bumper carrier hardware", along with the 12-volt battery, the coolant pump that keeps the battery pack chilled, and the HVAC filter housing. Since CR's car apparently didn't suffer from any issues with these assorted bits, it seems that Tesla knew of issues ahead of time and took proactive measures. And it's nothing compared to the laundry list of issues Edmunds dealt with – including three drivetrain replacements – during it's long-term Tesla test. CR is quick to point out that the service experience has been top-notch, with Tesla picking up the car and providing a loaner (CR declines, since it has a fleet). And while its car is a sample size of one, last year's auto-reliability survey – based on consumer experience – pegged Tesla as "average". We'll see if that changes when CR's next study comes out this fall.